Last year at the National Sports Collectors Convention in Cleveland, Ohio, an FBI agent took possession of an 1869 Red Stocking trade card owned by Net54 moderator Leon Luckey suspecting that the relic had been stolen from the New York Public Library’s famous Spalding Collection. Sources indicate that the agent wanted to examine the back of the card for evidence of an NYPL stamp and that after examining it, the card was returned to Luckey, the co-owner of Brockelman & Luckey Auctions. During the convention, a collector inadvertently posted on YouTube a video which caught Luckey talking to his partner Brockelman about the card in question as the collector was filming the materials displayed in Luckey’s showcases. That same card which was returned to Luckey is now appearing in the current Heritage auction as part of the sale of his type-card collection. 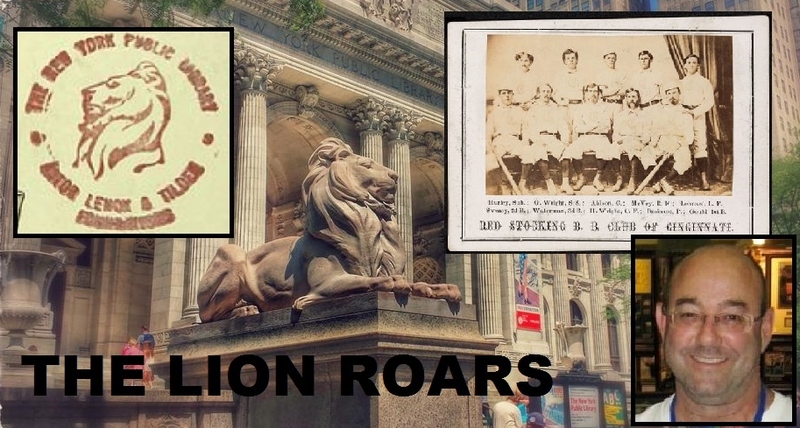 Heritage, however, has posted a high-resolution scan of the back of Luckey’s 1869 card and the image clearly reveals an NYPL stamp featuring one of the library’s sculpted marble lions which are named patience and fortitude and have stood guard at the entrance of the 5th Avenue branch since it opened in 1911. The evidence of the stamp on the back of the card is unimpeachable evidence that Luckey’s prized possession was stolen from A.G. Spalding’s collection which has been housed at the library since 1921. The library has suffered staggering multi-million dollar losses as a result of a 1970s heist that has been reported on in the New York Times and the New York Post. Leon Luckey's 1869 P&S trade card of the Red Stockings shows the remnants of a red stamp on the reverse. Why the FBI returned the stolen relic to Luckey last year after examining it is unclear. What is clear, however, are the remnants of the red NYPL stamp that definitively document it as property of the City of New York. When we examined the scan of the back and viewed it as a negative image (similar to an x-ray) the word “Library” from the oval NYPL stamp was clearly visible along with the circle that follows the word. A closer x-ray view of the back of the HA card (left) reveals the word "Library" and a following circle that match the NYPL oval stamp (right) exactly. Hauls of Shame also sent the Heritage back scan to a skilled SABR member who overlayed it on top of an NYPL stamp found on another card in the Spalding Collection. The result was an exact match for every visible point of emphasis on both the Peck & Snyder card and the oval NYPL stamp. An oval red stamp that appears on the backs of other NYPL Spalding photos (left) appears to show points of emphasis which are identical to the remnants left on the card being sold by Heritage (right). The remnants and the full stamp exhibit the exact same lettering, graphics and lion outline and definitively prove that Heritage is, yet again, selling property stolen from one of the nation’s most prestigious research libraries. 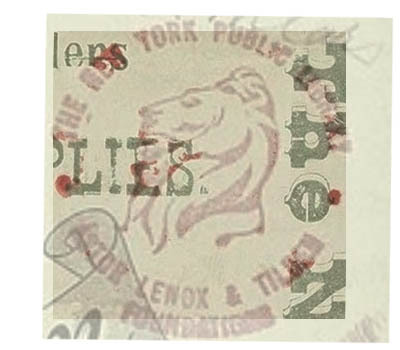 When the NYPL lion stamp is overlay-ed on the image of the surface on the reverse of Leon Luckey's card, the result shows an exact match confirming that the Heritage auction lot was stolen from the NYPL. Luckey’s card is an 1869 trade card issued by the Peck & Snyder sporting goods company and depicts the members of the champion Cincinnati Red Stockings who went undefeated that season. The card is one of several examples that were stolen from the NYPL including another card which was confiscated by the FBI at the National Convention in 2012 when it was being sold by Legendary Auctions. The FBI examined the card under an ultraviolet light which revealed another blue rectangular stamp used by the library to document ownership of Spalding items. That card was offered for sale by auctioneer Doug Allen who has recently plead guilty to charges of wire fraud in an FBI probe into corruption in the memorabilia industry. The stolen card currently for sale at Heritage was also previously sold by Allen and his former partner Bill Mastro at MastroNet in 2000. Mastro has also plead guilty to wire fraud in the same case and Luckey’s stolen card can be traced back to Mastro’s former partner, Rob Lifson, who sold the stolen card in his own Robert Edward Auctions sale in 1997. The stolen 1869 P&S card was sold by Rob Lifson (left) at REA in 1997 and again by Lifson and Bill Mastro (center left) at MastroNet in 2000, Net54 moderator Leon Luckey (center right) allegedly purchased the card from MastroNet and consigned it to Chris Ivy (right) of Heritage in 2015. Lifson, of course, is notorious as the only individual to ever be apprehended while stealing similar 19th century photographs and cards from the NYPL’s Spalding Collection. When Lifson was caught stealing in 1979 TIME Magazine reported that he had $5,000 cash on his person and that the thief claimed to have made that cash selling cards in “just one day.” Many of the stolen NYPL relics ended up in the collection of Lifson’s top client Barry Halper and sources indicate that the current card for sale at Heritage was offered at Christie’s in 1996 and prior to that was part of the Halper Collection. Luckey and Chris Ivy of Heritage Auction Galleries were hoping that the 1869 rarity would fetch a six-figure price considering the auction house calls the card the highest graded example in existence. But after Hauls of Shame alerted the NYPL and the FBI of the presence of the library stamp on the reverse their plans to cash in on the stolen treasure began to unravel. In fact, sources indicate that both Luckey and Ivy were aware that the card had the NYPL stamp and was stolen property as Ivy and Heritage noted in the lot description: “Fragments of some type of red stamp appear on the upper part of the verso. There is surface marring or erasure on the back in the same upper quadrant. This could be a library stamp, a collector stamp or the mark of some retailer.” There is no question that the stamp is a library stamp—an NYPL stamp featuring a lion. Heritage’s false claims that the ink remnants could be from a “collector” or “retail” stamp are wholly disingenuous and demonstrate what appears to be outright consumer fraud. Luckey also references a conversation he had with New York defense attorney and collector Jeffrey Lichtman stating: “Lichtman says no way they (the FBI) could take it, he says it’s been way too long.” Luckey also claims that dealer Kevin Struss owned the card previously stating, “Well, Kevin Struss had it, he sold it to Montgomery in ‘97. Just talked to Kevin, he said he can’t remember exactly where he got it. He says he might, he probably has a record of where he got it (unintelligible), he didn’t know offhand. Kevin sold it to him…” Struss likely bought the card after it was sold by Rob Lifson in the 1997 REA auction. The 2014 conversation between Leon Luckey and his partner was posted on YotTube (left) and mentions the 2012 FBI seizure of another stolen 1869 trade card with an NYPL stamp. The stamp was defaced but an ultraviolet light revealed that it was NYPL property (right). The “JC” that Luckey refers to is J.C. Clarke who apparently was the consignor of the other stolen card to the Legendary sale. The card was pulled from the sale and then returned to Clarke and it is unclear if it was ever actually returned to the NYPL. Angela Montefinise, the NYPL’s Director of Communications said she could not comment on the current FBI investigation into this particular card but a source familiar with the probe said the library is aggressively pursuing recovery of the six-figure Spalding treasure. Hauls of Shame asked Chris Ivy of Heritage Auctions for comment on why he was selling another item stolen from the NYPL but the auction house’s sports director failed to respond to our inquiry. Heritage has a long history selling stolen goods from the NYPL including the 1879 player contract of Ezra Sutton signed by Harry Wright and Henry Chadwick’s 1894 NY Giant season pass. Apparently selling stolen property donated to institutions doesn’t phase Luckey and with his 1869 card still for sale on the Heritage website it appears he isn’t willing to help the FBI (who he claims to have on his speed dial) recover this particular stolen treasure. Brockelman: What do you mean? Luckey: Picture of the back. (lowered voice) (unintelligible) NYPL. Oh you didn’t hear? Brockelman: Well I knew, I mean, what’s, I didn’t know he’s, what, we are bringing this guy around, what, inspecting everybody’s cards now? Luckey: I don’t know, if I want to say to him, I can say no. So he looked at it. Thinks it. (lowered voice) Private detective, NYPL. Brockelman: Well, when, it was first. If he thinks that he certainly has the equipment. Luckey: He says he’s confident. Brockelman: Why wouldn’t he have (unintelligible) the picture with him forever. Luckey: Well he’s going to do it now. Brockelman: But, why wouldn’t you have already had that with you, obviously they knew they were coming here to do that. Brockelman: So they just took it away from you? Brockelman: Well they sure as hell not going to give it back to you. I would, they would need to have a form from the library that says uh, that we are…..
Luckey: Well, no, no. I think I will get it back for now, I just don’t know the long term prognosis. Luckey: Lichtman says no way they could take it, he says it’s been way too long. Luckey: I don’t know. 10k is what I have into it. I don’t know, it’s a little unsettling the whole thing. Brockelman: No, I don’t think they just happen to come over here and say ‘look at that’. Luckey: Although he didn’t bring his stuff. He’s borrowing somebody else’s so I don’t know. Customer: Do you have any cabinet cards. Man’s voice: You taking pictures, huh? Brockelman: Well, I know, but they obviously know who did. I have a pretty good idea. I’m sure they probably do. Luckey: Well, they just found one, one or two years ago, last year…..
Voice: Hey Frank, what’s going on. Frank: How are we doing? Frank: Leon, how are you? UPDATE (July 14th 4:50 PM): Heritage has withdrawn the stolen Peck & Snyder card from its current sale. I am an interested third party. Just in case people can’t hear the speaking well from the youtube video, here is the transcript I made from the first 3:30 seconds of the video, which is the relevant part of the video featuring Leon and Scott talking about Leon’s Peck and Snyder card. If you watch the video with the sound up and follow the transcript, it is much easier to discern what they are saying. It’s interesting to hear how much Leon and Scott already know about this card and the fact that the investigator had looked at it and was ‘certain’ according to the said detective that it was NYPL property. But Leon said he was advised that “too much time had passed” that they couldn’t take it. Scott says he had a good idea who might have stole it and the authorities probably have a good idea too. Mr. Luckey is welcome to come on here and make any corrections to the transcript. Well, nothing surprises me at this point. Scott Brockelman didn’t seem to have any questions in his mind as to whether it was stolen or not. Leon didn’t seem to question him on his comment at that point either. If not for Leon banning people from Net 54 who dare to speak out against him he would be getting ripped apart right now on the board. He’s an unemployed, convicted drug dealer. What do you expect from such a guy. He keeps telling us how brave and wonderful he is to sell his collection to pay for his daughter’s education but what father wouldn’t do such a thing? You’d think he was raising money to cure cancer. Well, he’s sadly mistaken if that’s what he’s falling back on. The NYPL has never deaccessioned items from the Spalding photograph collection. In the past they deaccessioned duplicate copies of Spalding Guides etc. In one case they sold to the Library of Congress a rare copy of the Pocket Companion but that’s the only instance of a valuable baseball item ever being deaccessioned or sold (and that booklet wasn’t from the Spalding Collection). Not only are there Luckey’s 1869 card and the other 1869 card seized from the Legendary auction, there was another P&S Reds card recovered by the FBI several years ago and there is yet another one missing from the Spalding Collection that was illustrated in Seymour’s book…and that one has never surfaced publicly like Luckey’s card. “We are making sure it was in fact stolen”? Ah…..I think Mr. Nash has pretty much shown that. More like wait until reality has sunk in. I’m pretty sure Heritage was trying to troll Mr. Nash w/ the “This could be a library stamp” auction description. They were basically saying, “we can sell whatever the f we want and even say its a library stamp”…. that took some balls that have been inflated by countless other outings of Heritage by Mr. Nash that seem to go without recourse. I guess if you can sell stolen goods from the NYPL including the 1879 player contract of Ezra Sutton signed by Harry Wright and Henry Chadwick’s 1894 NY Giant season pass, without anyone but Mr. Nash saying anything….it would give you an sense of invincibility. It seems like Heritage is a much bigger culprit than many give them credit for. Take a look at Mr. Nash’s prolific investigative reporting back to 2010… Heritage comes up just as often as Mastro/Legendary yet the Leon Luckey collection comes out on Heritage Auctions and its “get me a catalog.” This episode too will be forgotten by the Heritage faithful….just as soon as the next auction starts. The hobby already has their whipping boys… don’t need anymore right now. For full disclosure….I was banned from Heritage Auctions (not that I ever participated in them) for contributing research to article Mr. Nash wrote regarding ticket stubs. He quoted me in a story and I was banned from Heritage Auctions the next day. I subsequently tried to join Leon Luckey’s online forum NET54 and was banned for life by Mr. Luckey without ever being made a member or posting. apparently he will be your worst friend if you are doing something bad in the hobby or providing a quote to Mr. Nash for an article. I think the following question needs to be posted on Leon’s website. Leon, would you have bought the card at auction if it were listed as having a NYPL library stamp on the back and had the description that there was no proof that it wasn’t de-accessioned, so it is being offered for auction? If his answer was that he wouldn’t have bid, then he shouldn’t be trying to sell it now under the same guise. Maybe the fact that he stands to realize a profit of 60-90 thousand dollars over the price he paid for it trumps all of these questions. How does SGC grade that card at that level with the visible removal of a library stamp on the back–and knowing all of the documented problems with these Red cards in terms of theft? Why would anyone have a “…pretty good idea” of [who stole it]? According to its website, Heritage has withdrawn the stolen 1869 P&S Reds card from the current sale. Some teenager with an exacto knife cut out lots of NYPL stuff and sell to Halper? How can you grade such a card and not see the stamp? Heritage should never have touched this. Mastro might look up Chicago hoodlums in Marion, get some “love that Italian restaurant” lines ready. Leon just locked the thread on Net 54 because someone pointed out the obvious: you don’t need to sell a million dollar collection to pay for $200,000 worth of tuition. The only way he returns the card to the NYPL is if he does so solely for publicity value. He’s clearly desperate for money so I predict he’ll try to figure out a way to keep the card or as much of it in dollars as he can. But if all else fails after fighting tooth and nail he’ll give it up and tell everyone what a great guy he is by giving the card back. Maybe Heritage will then do another writeup on him about his great charity, the charity which begins and stays at home for Leon. Funny, Leon has no problems speaking about the card to the press — but censors his own board! Pre-war card collectors need a new forum thats not run by a bald headed lying hypocrite! To think a card expert (Leon) didn’t know that card was stolen is laughable. He was attempting to casually unload it with the rest of his collection as cover. Had it not been for Heritage Auctions high-resolution scans I bet he would have pulled it off! Leon can be reached at 214-282-4943 or leonl@flash.net if you would like to let him know your feelings direct on his involvement in fraud. You can’t question him on his own forum or you will get banned. Rules that apply to everyone else don’t apply to him. This hobby desperately needs a new forum not run by a lying hypocrite. Moreover, it would be nice not to see forum generated profits not go to Leon’s pocket. How “lucky” for Mr. Luckey that he can count on profits from these stolen goods to send his children to college while most of the rest of us have to work hard at earning an honest living and our children have to take out loans to do the same. And some these artifacts at one point belonged to my ancestor, Harry Wright. Too bad they ended up at they NYPL only to be stolen for some criminals and an auction house with no integrity to benefit from. Even if my family had them in our possession, they would not end up at auction so I could pay for my own children’s college! These items belong in, and were intended to remain in the public eye for all to see and learn about. They are a part of American History. Too bad my great-great grandfather didn’t pass them along to family to care for. I am sure he felt he was preserving important baseball history by doing what he did. It is a beyond shameful what can happen to the intentions of such an honorable man! I am glad to see he got his just desserts. Leon sure knows how to dish it out along with running Net54 forum like North Korea if it doesn’t meet his agenda. I am probably foolish to say this, but I have to wonder what his involvement is with card doctoring after this has come to light. Can I take a swing at this? I guess I couldn’t be more disapointed in Leon. He preaches about weeding out fraud yet turns a blind eye to profiting from it with every exuse he could come up with to justify it. I always had a bad feeling he was up to no good. One of the more interesting things about Leon is that for someone who often chooses to live on the scummy side of the hobby, he is a poor judge of who to trust. Most people who engage in questionable and morally corrupt behavior are cautious about who they confide in. Not Leon. He emails and calls people he thinks are on his side to commiserate his woes, and those very people forward the emails or relate the calls in detail to other people who dislike Leon. You’d think Leon would wise up and realize that many of the people he thinks are allies are laughing at him. He succeeds for the most part in controlling the sycophants he has surrounded himself with on Net54, having run off so many longtime posters who actually have hobby knowledge. But outside his little fiefdom, he’s viewed by so many in the hobby as either a clown or money-grubbing schmuck. I just listened to the youtube video by Jerry Spillman. There’s a lot more there that an audio expert could likely lift from the sound file with the proper software to filter out all of the background noise and static. Leon Luckey should probably step down from his position as forum moderator. As the evidence now shows, if he isn’t bothered by knowingly putting up for sale a card which is not his (stolen), then what else in his collection might also have questionable provenance? Locking a thread on network54 that is critical of him only makes Luckey look that much more guilty. So far, all we have from him are excuses NOT to return the card to its rightful owner. A callous, scheming “wait and see” strategy aimed at retaining the card for as long as possible. But Luckey has long known that the card was stolen and now he’s been caught in the act of trying to resell stolen property. The only thing that was unclear was who stole it. There’s also potential grounds for a lawsuit here to the extent that Luckey may have misrepresented the card to Heritage. And just think if the card would have sold for $100k to another collector and that collector would have had to return the card to its rightful owner (the NYPL). Could the winning bidder have sued Luckey? Probably, given Luckey’s prior knowledge of the card. Is there any question that pure greed has replaced Luckey’s ability to think rationally and ethically? Who would trust such a person who continues to remain so belligerent and unapologetic? Funny how the clowns at PSA even deleted a thread about this, everyone is so scared to call out these losers. Just sweep it under the rug and hope it goes away, they don’t want anything published that will put a black mark on the hobby that might take money out of their pockets. Also classy of SGC to grade this card without doing any research or investigation. not surprising he locked the thread to further comments. Good to see the national media covering this. Of course the NY Daily News gives no credit to this site for actually breaking the story and exposing the sale of this stolen card by Heritage. NYDN famous as shills for the Madoff Mets continue to shill for the Madoff of Memorabilia. Vevy interesting and telling that when Luckey mentions NYPL (stamp) in the video, he lowers his voice each time. Why? My interactions with Leon thought me that he is a completely two-faced sociopath. He operates his forum in the same manner. Funny, days later and he still hasn’t returned the card which even Heritage admits was stolen from the NYPL. What is he waiting for? Some more money so he can pay for his duaghter’s fourth PhD? If I set up a table and my cards get stolen, is there a reasonable chance the police will eventually recover them? If I keep detailed records and images, and follow up with many contacts within the industry, I would like to think the answer would be yes. What really worries me, however, is if they make their way into Leon Luckey’s collection. What then? Why hasn’t Leon returned the card? He’s been busy trying to phone a friend for advice. Trouble is, he’s figuring out he doesn’t have any. Still wondering why Leon didn’t want to write the Judge a letter in regards to the Mastro sentencing? If a hobby veteran like Dan McKee can see what a fraud Leon is than everyone should. Naturally Leon is blasting him to all his friends about daring to put a comment up here. Maybe at some point he’ll learn that when you’re a fraud the only true friends you have are other frauds like Bill Mastro, the guy who gave him a gift in order to get a favorable letter written to the court on his behalf. A man is measured by the company he keeps and Leon is loyal to Mastro, Allen, JC Clarke (who Leon threw under the bus about his own Peck and Snyder card) and Brockelman who sounds like he’s in the mafia discussing the FBI agent daring to do his job and attempt to learn if Leon’s card was stolen. Two slimeballs, caught on tape, whispering about possibly having a stolen card returned to its rightful owner. “I just don’t know the long term prognosis.” Yeap, that sounds like a guy who’s sure his card is on the up and up and not stolen goods. This is off-limits for discussion on Net54baseball! Surprised? Why is PSA on the Collectors Universe Forums blocking this from being discussed? And I guess Heritage removing the top lot in its premiers auction (a lot that’s owned by a guy who takes ad $$ from HA and all the other AH’s) isn’t a hobby news story worthy of coverage by Mueller Klein and Sports Collectors Daily crew. Why isn’t there any coverage over there? Oh yeah, people go there to get there Top 10 cards fixes. All shills every last one of them. Makes me sick. if Leon was just a regular member on Net54 you’d find out how people really feel about him, not just related to this incident. the guy is a complete two-faced SOB with nothing going for him. He said he would give the card back if the NYPL said it was stolen and asked for it back. The NYPL has done both. Heritage has admitted the card is stolen and refuses to sell it. Yet here we are days later and Leon still won’t give it back. He doesn’t want the 10K he paid for it, he wants exactly what’s he can sell it for. He lied about not knowing the card was probably stolen. He lied about promising to give it back. He gets called out by Harry Wright’s great-great granddaughter. And all he does in response is hunker down, cut off all commentary on him and the card on Net 54, bad mouth anyone who tells the truth about his fraud and his covering up for other fraudsters all so that he can quietly try to sell the card privately. Because no auction house will touch it because rhe card is bad. His friends are laughing at him and sending out his emails. Law enforcement won’t take his speed-dialed calls anymore. All for a stolen baseball card which he refuses to return. What a guy he is. To make a long story short… when I emailed Mr. Luckey about removing yet another negative thread about me on his board and explained how absolutely none of what was being said had even a shred of truth, his comment to me was, and I paraphrase, “I NEVER edit the content of what is posted…. it is an open board and users are free to post whatever they wish as long as they put their name to it, blah, blah, blah”. hypocritical? You be the judge. Also, Mr. Luckey’s almost comical constant critiquing of Mr. Nash is a little easier to understand now when put into full context. Mr. Nash…. relentless pursuer of items stolen from the Spalding Collection at the NYPL…Mr. Luckey….owner of item stolen from the Spalding Collection at the NYPL. It all makes perfect sense now…..
He’s an unemployed, repeat convicted drug dealer. What else can you expect? I don’t know Mr. Luckey and have read Net54 maybe 3 times in my life. I can’t imagine anyone bidding in his auction after reading these comments. I know I won’t. From his post on Net54: “The Peck and Snyder card has been examined and no mark is discernible.” Lie. From his post on Net54: “It has been examined and whatever was erased can’t be made out with any known equipment today.” Lie. From his post on Net54: “I didn’t have to bend over backwards to work with the authorities …” Lie. From his post on Net54: ” … you can spin this any way you want to but there is not one iota of anything I did wrong.” Lie. From his post on Net54: “I won’t respond to anymore of your drivel but will report back after the investigation is over.” Lie. From his post on Net54: “I am sorry I don’t live up to your high moral standards though. I will strive very hard though….” Lie (unless he can profit from it). From the Heritage auction catalog: Leon “sacrifices his labor of love for a love even greater, to fund the college education of his daughter.” Lie. Weed out fraud? He’s the poster child for fraud. I am proud to be banned from net54 for life. Leon is about profit. Once you filter out the sweet old man comments he makes about cards and the people that kiss his — since he is the moderator and owner of Net54 you can see the true Leon… A snake in the grass. Without HIS forum this jerk is a nobody. I commend Hauls Of Shame for the impressive research in reporting this article! It shows the conflicts of interests and why others won’t comment or say anything on this matter. I SUSPECT THERE IS A LOT MORE THAT GOES ON BEHIND THE SCENES WITH LEON THAN JUST THIS CARD! He likes to point out the 3rd grade level card scammers on Ebay but when it comes to big-time fraud he truly does not want it openly discussed. Everyone in this hobby needs to wakeup and smell the coffee. Does anyone have a link to scans of the card in graded holder that was put up for auction at HA? I can’t find them since the lot was pulled. If Leon is forced to give up the card he will surely put a spin on it like he made things right out of the goodness of his heart. Too bad Net54 isn’t owned and moderated by someone else! I hope this card makes it back to the NYPL safe and sound along with all the other stolen items. Mr Leon Luckey your silence speaks volumes about your low morale character. You could easily be making things right on this situation along with not censoring your own message board discussing this fraud! Oh, so this is why Leon doesn’t like people good at picking up features of “altered” cards to be outspoken on Net54baseball! It was just a matter of time before he put his up for sale. So last year the FBI agent tells him he’s ‘confident’ that the card was stolen from the NYPL and now Leon claims that he told him the total opposite. That the card was good to go. Why would Leon state a year ago that he was TOLD that the card came from the NYPL, that the FBI was “confident” that this was so and now he’s telling us all that the FBI told him the card was good? I’d bet anyone anything that the FBI agent if asked will state that he never told Leon the card was not stolen, that he in fact told him the complete opposite which is exactly what Leon reported in that sneaky talk with the dumbass Brockelman a year ago. Leon’s daughter has to be reading this and wondering how unlucky she is to have a lying liar for a father. And that he’s telling everyone he’s selling stolen cards and a million dollar collection for her college tuition which costs just a fraction of that. So disgusting. “There is nothing you have said that I am not aware of. The Peck and Snyder card has been examined and no mark is discernible. Just like it says in the description. He knew enough provenance to get really nervous about it being a stolen card in the audio on that video and to call a lawyer! I think we all get the picture. Honestly I don’t know anyone that actually likes Leon Luckey, they just bear with him since he is the owner of Net54. Same goes for his advertisers. He makes far more per month than you may supect in advertisement revenue! Sorry if the truth hurts Leon. I’m waiting to see how you twist the facts going forward! Here is directly from the Luckey’s social media page. With Leon Luckey it is always — always — first, second and third about the money. If you keep that in mind, then everything he does makes sense. Look no further than this Heritage auction. He thinks nothing of using his daughter as a pawn to favorably spin the reason he has decided to sell a collection he has lost interest in continuing. Leon and Heritage call it “philanthropy.” Most call it sad. Don’t dislike Leon Luckey. Pity him. Shady business will continue as usual with Leon since he owns Net54 and people have to put up with him. What does the future hold for this card? I hope it does not get swept under the rug like everything else in this hobby. Not defending Lukeys actions selling this stolen card but shouldn’t the real ire be directed at the alleged the if who has already admitted to stealing from the library and has sold or been tied to dozens of other items he sold to (and sold for) Barry Halper. How about some heat for Rob Lifson? I think he must have sent out a Net54 community cease and desist letter to anyone who utters his name. Or is it that he knows where all the cards are buried and the card fiends don’t want to cut off their connection to the Tony Montana of cardboard? Either way Rob Lifson is a low life and a thief and deserves more tarring and feathering than Luckey. Leon is probably scared shitless he will get sued if he points the finger at the hobby’s golden boy. I don’t think anyone has the balls to start a new thread on this subject since Luckey will obviously retaliate. Net54 censorship is now on par with PSA’s Collectors Forum censorship. Congratulations Leon. A full week later and the “investigation” complete, the NYPL and Heritage both say the card was stolen. The NYPL asked for it back and Luckey refused to give it to them “free and clear.” Despite promising to alert Net 54 as to what he was doing with the stolen card, Luckey stopped any commentary on it and issued a veiled threat to ban anyone who dares to discuss the card. Yet everyone else is either a “vile prick,” “fraudulent person,” “bold-faced liar” or “idiot.” Not Luckey, of course. He’s just an unemployed, convicted drug dealer who cannot tell the truth or do the right thing by the hobby. One note to all of the Net54 members reading these comments: Leon has the ability to read every “private” message sent through Net54. I was a chief moderator on another sportscard chat board that used the same software. Not only is there a security hole that allows anyone who knows what he’s doing to see all PMs, there’s definitely functionality that allows moderators to do the same. If you think Leon doesn’t make good use of that feature, you’re foolish. Lifson/Halper/Mastro/Coach in his corner…..remember SCD having them on the top of the mountain? The hobby imploded in greed. Thanks for the great investigation work HOS! The hobby needs to collectively revolt against dirt-bags like Leon such as NOT consigning with Brockelman & Luckey auctions and finding a new pre-war card forum. Cut off their $ since it is the only thing that they care about! Where are the scans of the card graded? Cory on Net54 makes a damn good point: How did this card with an ink stamp on the back get graded by SGC a VG/EX 4? Leon: You are a piece of work! What other fraud are you engaged in? I hope the FBI follows through with investigations based on this great work by Mr. Nash.